Taipei has really taken afternoon tea to a different level. It’s gotten to a point where it’s no longer acceptable to just have tea, a scone, maybe a slice of cake, and/or a savory. Instead, afternoon tea in many places actually constitutes an entire meal. Buffet style! Please note, some places do afternoon tea poorly. First, you have to line up in this everlasting queue to just even set foot into the restaurant, then you have to line up for ages just to get your food. If that wasn’t enough, you have to go through more undignified jostling to get desserts and coffee afterwards. The entire experience becomes a “grab what you can, while you can, before someone else gets to it first.” By the time you finish your afternoon tea, you are a grumpy, carb and sugar overloaded mess. Thankfully, there are some places such as Lar Farfalla, at Humble House that gets it just right. Located on the 6th floor of Humble House Hotel, you are transported in to a bright and airy space as soon as you alight from the elevator. 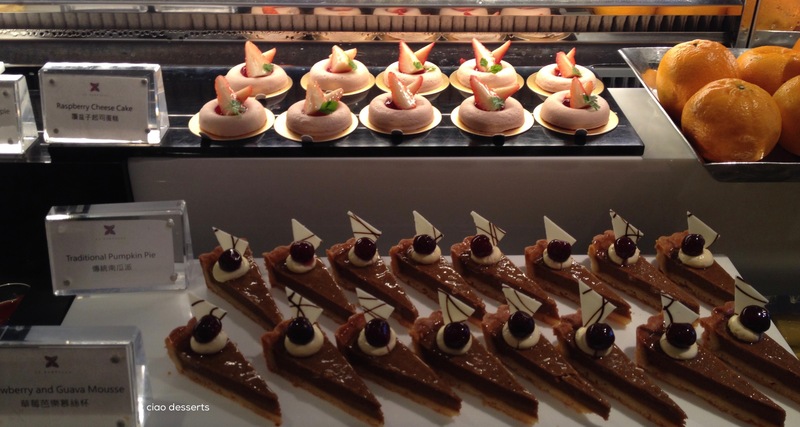 At La Farfalla, you are greeted with a, what I can refer to as a responsible selection of savories and sweets. I heard one girl loudly （and quite rudely) complain “why do they use salads to take up space in the buffet? It’s just to trick people into thinking that there is more than there actually is!” I, have, of course, the completely opposite view. Just look at this selection! I love it when they incorporate local ingredients, such as bitter melon and water lily leaves into the salad bar. All the leaves and veggies are carefully trimmed and washed, the carrots and sweet potatoes are steamed to perfection, and cut to perfect bite sized pieces. A lot of work goes into this! I don’t usually have the patience for this at home, so I always build a lovely salad for myself, whenever I see a well-stocked salad bar at a buffet. For my first plate, I always have a bountiful salad, I usually skip most of the hot food, and then I proceed merrily to the desserts. I find this formula helps me avoid a food coma, which means I still have clarity of mind to chat to my dining companions. Most of the food at La Farfalla centers on Italian (fusion). There are pizzas, risottos, and some other items. Since I usually skip the entrees, I forgot to take photos. One of my favorites were these mini sandwiches, and mini lobster rolls. I had forgotten how much I love lobster rolls until this afternoon! There were also some delicate savories, such as smoked salmon, and topped mini toasts. The raspberry strawberry cheesecake (back row) and the pumpkin pie (front row) I didn’t have time to even go out and buy a can of pumpkin puree, like last year, so pumpkin pie was just a dream until now. There were also caneles, ginger flavored cheesecake, rose mousse with red currant sauce, strawberry cake and berry panna cotta (I think). This is what I ended up choosing~ along with a perfect macaron (chocolate!) Everything except the rose mousse with red currant sauce, (top) was perfection. I think I should just avoid floral flavored desserts from now on, because the scent just reminds me of my body wash, or face creams. The pumpkin pie had the right amount of all-spice, and tasted just as good as my memory serves. The cheese cake was creamy, and just the right size. One other part I enjoy about La Farfalla is that they bring drinks to your table~ My latte wasn’t the best in the world, but it was good enough (and not having to wait in line for it made it even better). In a nutshell, LaFarfalla is a lovely place for afternoon tea. The tables are spaced generously apart, the buffet has just the right amount of variety, and the service is unobtrusive, yet attentive. My only tiny regret for the entire afternoon, was that I didn’t get a chance to take a clear photo of the fabulous lamp in the entry way. By the time we left, evening light had set in, so I wasn’t able get a good photo of this lamp. 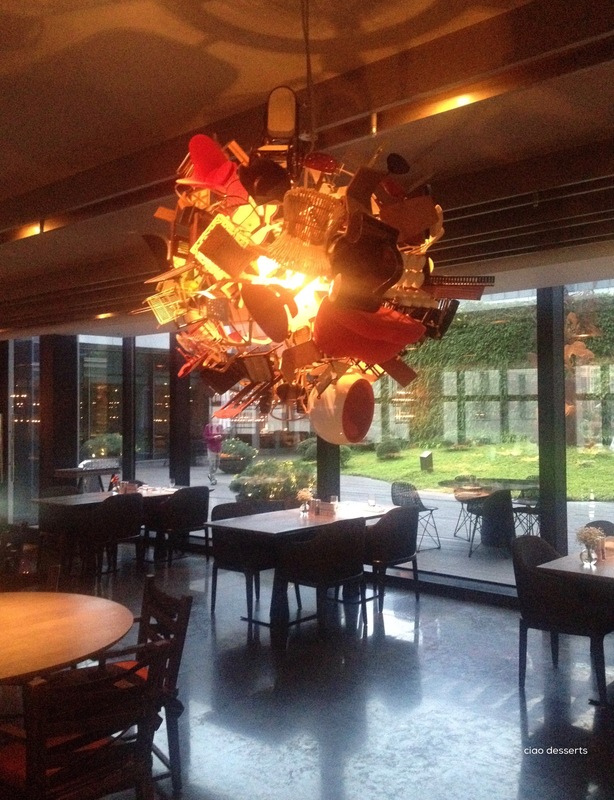 It’s called the “Nice Ball” by Paula Pivi and it’s this collection of Vitra tables and chairs all crazily fitted together into a pendant lamp. I don’t have words to express why I love this lamp, but I do. This entry was posted in Uncategorized and tagged afternoon tea, buffet, coffee cups, desserts, Italian, Taipei, tea. Bookmark the permalink. was the woman’s complaint about the salad bar directed at an employee? if so, i hope you told the staff that you appreciated the salad option. also, never had bitter melon raw. is it good? there are some veggies like broccoli and cauliflower that i just refuse to eat raw. i’m deciding if bitter melon should also be banned from the raw list 🙂 thanks for the photos; loved seeing the beautiful selection! Hi HT, the women’s comment was directed at her friend, but she was loud enough for the entire restaurant to hear. I can’t eat broccoli or cauliflower raw either, but bitter melon is quite delicious if sliced thinly. Another surprising salad item is bell fruit and guava~ delicious with a balsamic vinaigrette!